One of the top AM radio stations that’s still cooking is Chicago’s WGN-AM, owned by the Tribune Company. (“WGN” stands for “World’s Greatest Newspaper.”) It’s a mixture of news, talk, and Chicago Cubs broadcasts. And, apparently, it has some very tight, new standards on what’s allowed and what’s not allowed to be said on the air. 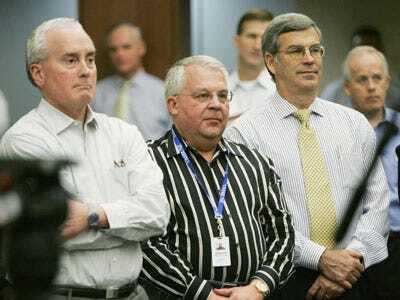 Tribune Company CEO Randy Michaels (pictured, centre) recently created a list of 119 words and phrases that are no longer allowed on WGN’s air. Long-time Chicago media reporter Robert Feder, now blogging for a site owned by the city’s NPR affiliate, published the list. “Two to one margin” . . . “Two to one” is a ratio, not a margin. A margin is measured in points. It’s not a ratio. Informed sources say . . . Meanwhile, the funny folks at public radio’s “Wait Wait, Don’t Tell Me” — also based in Chicago — tried to use all of these words in one sentence. It’s worth a read.